On the first day one long black candle appears that is followed by three or more short ascending white candles. The three short candles must be contained within the first candle’s body. Then another long black candle closes the pattern. The last candle is large and black again and creates a new low. 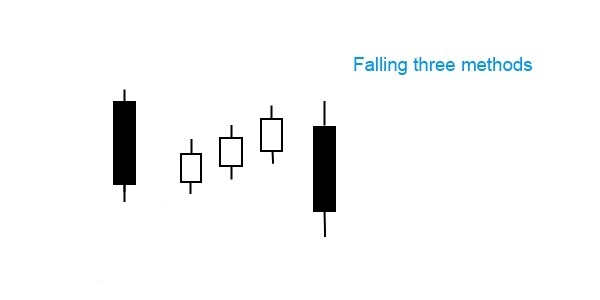 How is the falling three methods sign interpreted? This pattern shows the market taking a breath before continuing its downtrend. Though the falling three methods pattern is quite scarce, it signals the continuation of the prevailing trend. Such as its relative the bullish rising three methods, this pattern confirms that the attempted penetration will fail, and that the trend will continue.